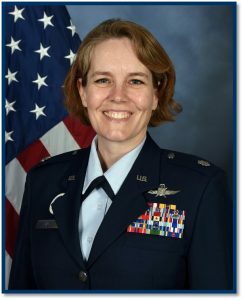 Lt Col Theresa D. Beaver is the Commander of Air Force Reserve Officer Training Corps (AFROTC), Detachment 430, University of Mississippi, in Oxford, Mississippi. She is the Department Chair and Professor of Aerospace Studies, leads a cadre of instructors and support staff, and is responsible for recruiting, training, and commissioning the leaders of tomorrow’s Air Force. Lt Col Beaver entered the Air Force in January 1989 and served eleven years as an enlisted Communication-Computer Systems Operator. She was accepted into the Airman Education and Commissioning Program in 1997 and graduated from the University of South Carolina with a Bachelor of Science degree in Computer Science in 2000. She attended Officer Training School at Maxwell Air Force Base, Alabama before beginning her career as a Cyberspace Operations Officer and later went on to earn her Master of Science degree in Computer Science from the Air Force Institute of Technology in 2005. Lt Col Beaver has served in many leadership positions at the flight, squadron, major command, and forward operating agency levels. She had the privilege of deploying to Balad AB, Iraq in 2006 as a U.S. Special Operations Command Historian. Prior to her current position, Lt Col Beaver was the Operations Officer for AFROTC Detachment 880, Virginia Military Institute, the third largest ROTC detachment in the Air Force.